Car finance deals are becoming increasingly popular amongst prospective buyers in the UK, yet many consumers are unaware that through finance plans such as Hire Purchase (HP), Personal Contract Hire (PCH) and Personal Contract Purchase (PCP), they can drive away in a set of wheels for as little as £27 per month. 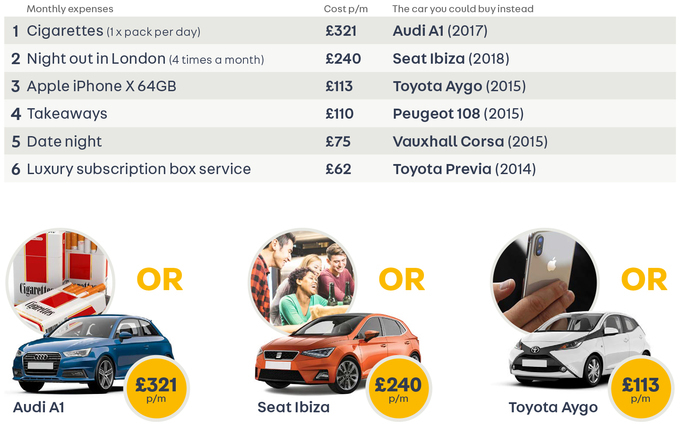 To illustrate, Auto Trader, the UK’s largest digital automotive marketplace, reveals the lifestyle changes you can implement to make owning your dream car a reality. According to a recent study, Britons spend on average more than £2,100 a year in coffee shops, forking out a massive £184 a month. If they were to put that money towards a car instead, they could be the proud owners of a swanky vintage Porsche. Even still, many people are overwhelmed by financial jargon. That's why Auto Trader has created its intuitive car finance calculator, enabling car buyers to search the UK's largest automotive marketplace based on their monthly budget for the very first time. The marketplace brings together the largest and most engaged consumer audience. Auto Trader has over 88% prompted brand awareness and attracts an average of 55 million monthly cross-platform visits a month, with circa 70% of visits coming through mobile devices. This press release was distributed by ResponseSource Press Release Wire on behalf of Re:Signal in the following categories: Men's Interest, Motoring, Business & Finance, for more information visit https://pressreleasewire.responsesource.com/about.